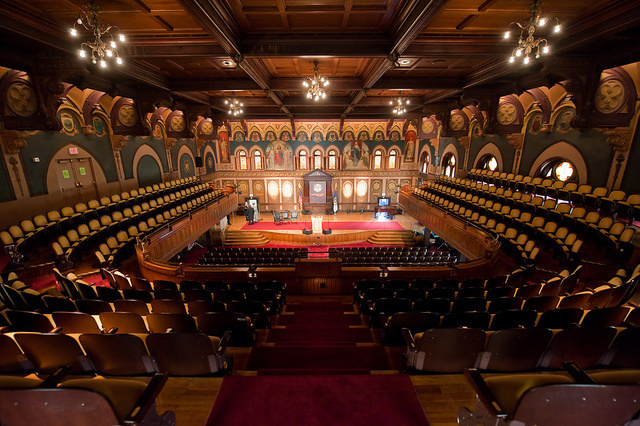 The events of “In Nature’s Wake” will take place in three venues on Georgetown’s campus: Copley Formal Lounge, Historic Gaston Hall (pictured below), and Lannan Center for Poetics and Social Practice, which is located on the fourth floor of the New North building. It’s simple to cycle to Georgetown from almost anywhere in the District. A full map of DC bike routes is available here (PDF download); and bike racks are available near all the major venues listed above. Capital Bikeshare has a station directly outside Georgetown’s gate at 37th and O, NW: a map of this very convenient system is available here. Please do consider these options. The university is accessible, but not easily so, via public transit. Several buses stop near campus on Wisconsin Avenue, such as the D2, 31, and the DC Circulator. Georgetown University also offers a free shuttle service, GUTS. GUTS provides shuttles between mulitple spots on campus and high traffic locations like the Rosslyn and Dupont Metro, the Law Center, parts of Arlington and Wisconsin Avenue. These buses are available to the public, but you are required to show a photo I.D., and log in your name and reason for visiting with the driver. Once you have arrived on campus, use our campus map (http://maps.georgetown.edu) to find your way around, and feel free to call (202) 687-6294 for further assistance. If you must drive to Georgetown, there are two parking options available to you: street parking at the main campus’ entrance or the Southwest Parking Garage. The main entrance is located at 37th St. and O st. NW. The surrounding streets offer limited metered and free parking. This is the best option if you are only planning to be on campus for a few hours. If you plan to stay on campus for an extended period of time, such as for one of our events, you should park in the Southwest Garage, which is accessible via Canal Rd. NW. Daily parking starts at $18.00 then drops to $12.00 after 3 pm and $6.00 after 7 pm. Student Parking Rate with GU ID after 5:00 p.m. is $3.00.